Ice cream is a staple at any fair, midway, or concession stand, and there's no better way to serve your popular ice cream flavors than in a waffle cone! Carnival King is dedicated to serving each patron like royalty with light and flaky waffle cones made from this premium mix. 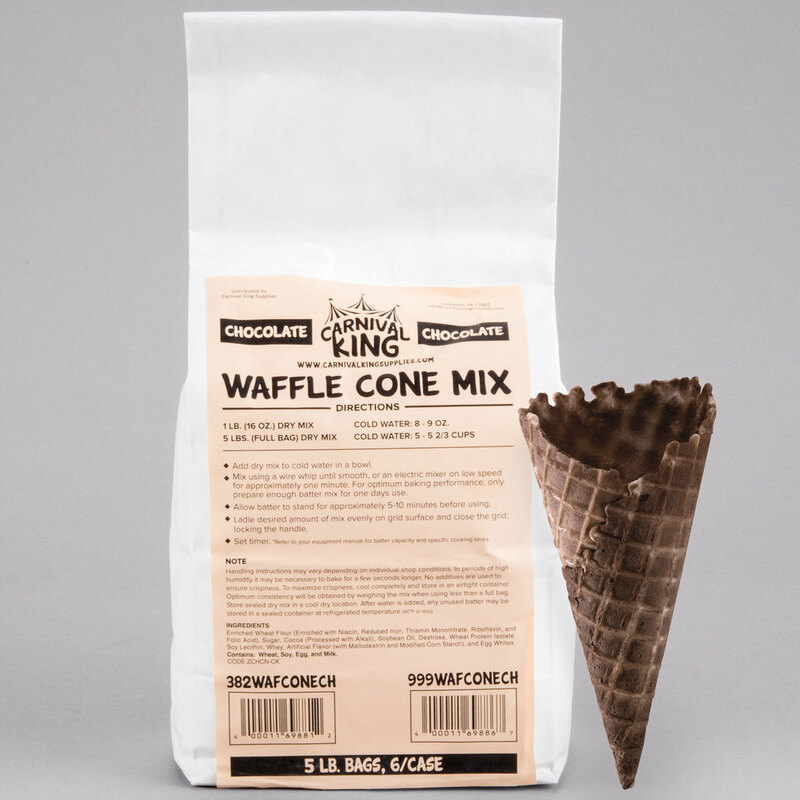 Rather than risking breakage and damage from pre-packaged waffle cones, Carnival King's chocolate waffle cone mix allows you to prepare and serve your own waffle cones for a homemade, authentic feel that customers will love. Waffle cones enhance the aroma and taste of your ice cream servings - not to mention that their unmatched appearance boosts impulse sales, too! Compared to traditional waffle cones with a golden brown color, waffle cones made from this mix have a rich brown color and semi-sweet chocolate brownie flavor that complements your serving without overpowering the flavor of the ice cream itself. Fill your waffle cones with scoops of ice cream for the ultimate summer treat, and watch as lines begin to form at your carnival cart or ice cream parlor! Upgrade your ice cream supplies, and offer fresh-made waffle cones as an appealing alternative to standard cake cones or plastic dishes. Easy to prepare, this mix is also great for making ice cream sandwiches wafers, or other dessert dishes. To prepare, add dry waffle cone mix to cold water, and mix until smooth. For every 1 lb. of dry mix, use 8-9 oz. cold water. For every 5 lb. full bag of dry mix, use 5-5 2/3 cups of water. Allow the batter to stand for approximately 5-10 minutes before using, and then ladle the desired amount of mix evenly on the grid surface of your waffle cone maker.